Drift The Trio | OK Listen! 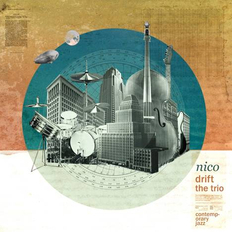 Drift is a contemporary jazz guitar trio from New Delhi, India. The band has performed both, as a trio as well as a part of larger setups featuring vocalists, saxophonists and other instrumentalists from around the world. Led by Drummer Reuben Narain, the band's music is an eclectic mix of modern music styles like Funk, RnB, Fusion etc. with the compositional vision and improvisational styles of jazz greats like John Coltrane, Chick Corea, Thelonious Monk and Pat Metheny. Each member of this trio has toured and performed extensively as session musicians with some of the most successful jazz/rock artists in this country and abroad. They have been featured at almost all major music festivals held in India. The Idea behind coming together as a band for us, was to write new music that could be a confluence of our personal musical journeys, without being restricted only by commercial considerations. Also, through this band we have found a way to celebrate the music of some of our idols. The group performs the music of some of the greatest jazz/blues composers with fresh arrangements and a ‘new sound‘.